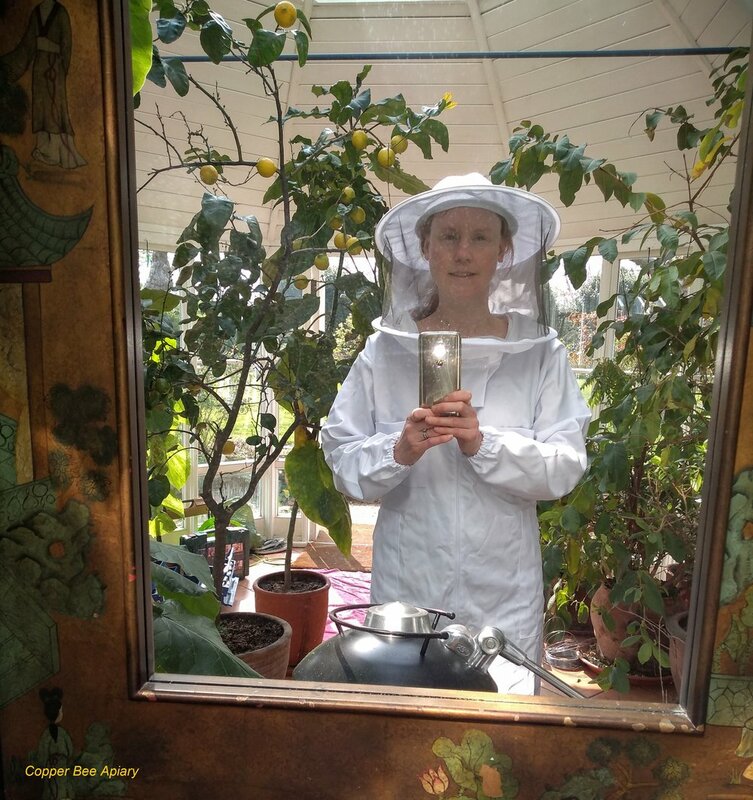 I’m declaring the Copper Bee Apiary 2019 beekeeping season (my sixth!) to be open. All colonies are alive and I’ve at least had the rooves off all of the hives even if I’ve not yet done a full brood box inspection on them all. I am very happy that they all survived the winter, because I had feared the worst. I have a new beesuit this year. The veil on my old one had got difficult to see through, so it has now been relegated to the role of spare beesuit. One disadvantage of the new suit is that it has no thumb loops, so the cuffs move up and down as I move my arms, exposing variable amounts of wrist. I worry that bees settling there may be inadvertently nudged or brushed off by a moving sleeve, so I’m going to sew some elastic thumb loops on so the cuffs stay put. This will also avoid leaving a gap of skin for angry bees to target if I’m wearing gloves to do some more “dangerous” task. 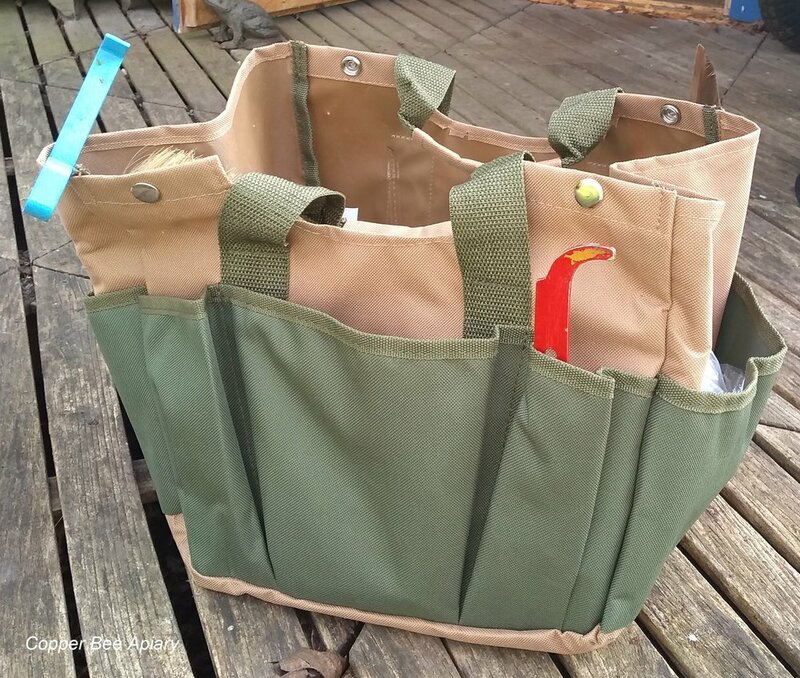 I think it was designed to be a gardener’s bag, but it lends itself equally well to beekeeping, and replaces the Sainsbury’s orange elephant bag for life that I used before. were the first that I opened. There was plenty of brood, which I squinted hard at, trying to see if any of them showed signs of EFB. There was nothing obvious (to me), but I wondered if some of the larvae looked a little bloated. I decided to test one with my EFB lateral flow diagnostic kit. It was negative. Which is good, of course, although it feels rather inconclusive as yet. Hopefully the Bee Inspector will confirm that they have the all clear later this month. Negative. Only the control band shows. What I also did with this nive, and with the others that had supers left on over winter, was to reposition the super from underneath the brood box to on top of it. The “normal” position for a super is above the brood box, perhaps partly since the bees naturally store honey above the brood nest as the season progresses, but mainly for the beekeeper’s convenience in being able to lift supers on and off the hive to raid the honey. The main reason for putting the super underneath the brood box during winter is so that the bulk of the bees and the brood nest - which gradually move up to the top of the comb during winter as the stores are consumed - will be found in the brood box come spring, rather than in the super. The empty super can then be repositioned at the top of the hive ready to receive the spring honey. whose brood combs seemed, mercifully, to be hanging in an orderly parallel fashion. Quick look at one of the central combs - covered in brood, with nothing looking too untoward. So far so good, although again we’ll have to wait for the Bee Inspector’s verdict. All I have done with these two hives at present is to remove their dry boards and sugar boards and replace the crown boards with fresh ones. But there was quite a contrast between them - Queen Mab’s colony had eaten nearly all their sugar, while Queen Romaine’s had (unexpectedly) barely touched theirs. I’m hoping for a window of warm weather this weekend to look for signs of brood disease in these colonies. Though either way they will both be shook swarmed on to fresh undrawn combs, and the old combs destroyed, to hopefully eliminate any EFB.